While it’s wonderful to look at, The Golden Compass fails to conjure up a sense of wonder. The Golden Compass is a big, beautiful $180 million movie based on the book by Philip Pullman and it’s been reported that its pricey tag could potentially result in the demise of New Line Cinema. While it’s not that big of a disaster, massive, widespread appeal might be elusive. Part of the problem is that, even though it’s being marketed as a “children’s movie” in the same vein as the Chronicles of Narnia, it is rated PG-13 for some particularly creepy characters and one shocking bit of violence involving battling, armored ice bears. Oh, and in contrast to Narnia, adding to the frenzy of attention are calls for boycotts from certain Christian groups. Pullman is agnostic and his books take a swipe at organized religion. And, even though Chris Weitz, the movie’s less-than-obvious choice of director and screenwriter who’s better known for movies like About a Boy and American Pie, has thinly veiled Pullman’s message, it’s still quite clear who’s being jabbed at when one stops to think about this mysterious group called the Magesterium. The Magesterium has global influence and it wants to steer children away from something called “dust.” That cosmic matter is essentially free will, an energy passing through the universe to daemons, the animal manifestation of the human soul, which then gets transferred on to the daemon’s human being. The process is called “intercision” and on more than one occasion it’s described as “just a little cut.” Think intercession melded with circumcision. At the heart of The Golden Compass is a girl named Lyra Belacqua (Dakota Blue Richards in an incredible debut performance). She takes great umbrage at being called a lady; she’s a tomboy to the core. Her uncle is Lord Asriel (Daniel Craig, Casino Royale), a scientist ever-so-close to unlocking the secrets of parallel universes. His work has fallen under the careful watch of the Magesterium, which is afraid of what he’ll uncover and wants to put an end to his work by putting an end to him. The movie starts with Lyra thwarting a poisoning attempt on Asriel. Fairly inexplicably, Lyra then makes the acquaintance of Marisa Coulter (Nicole Kidman, Moulin Rouge! ), who is so enchanted by Lyra she sweet talks her into accompanying her on a trip north. 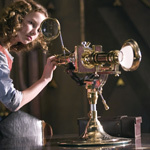 As a going-away gift, Lyra is given the last known Alethiometer, a truth-seeking device that nobody on Earth knows how to use. Except for Lyra. It’s in her dust, if you will. A couple of Lyra’s best friends wind up being kidnapped and taken to the north for experimentation. Lyra, on the other hand, picks up on Marisa’s evil nature and escapes her clutches. What ensues is a choppy story that revolves around rescuing the children up north. The movie ends after that mission, before the book’s more controversial tone veers toward overtly agnostic sentiments. Weitz’s hope is that by toning down the anti-religious themes this time around, the movie can build up a large enough audience to warrant the filming of the saga’s next two books, known collectively as the His Dark Materials trilogy. There’s quite a lot to take in and adjust to while navigating through Pullman’s world. Seeing people with constant animal companionship that runs anywhere from spider monkeys to tigers takes some getting used to; double that to grasp these animals are an embodiment of the soul. The animals are marvelously rendered and all the elements are there for a whole new fantasy on the classic level of The Wizard of Oz. But as the movie unfolds apathy develops. Even amidst the sinister activities of the Magesterium, there’s not enough buy-in created for this fantastic world to get the sense that anything is really at stake. That’s a real shame considering how much this movie has going for it on the surface. There are so many ideas to mull over and all those marvelous visual elements, a quirky, nifty melding of high-tech, modern day, and 1930s pulp science fiction. And there’s also one heckuva cast. There’s no doubt about it, Dakota Blue Richards is talented and she’ll be back in other movies for years to come. In addition to Craig (who’s role is preposterously small) and Kidman, Richards shares the screen with some other seasoned pros including Sam Elliott (wouldn’t you know it, as a hick cowboy adventurer), Christopher Lee, Eva Green, and Derek Jacobi. Plus, Kristin Scott Thomas, Ian McKellen, and Kathy Bates supply the voices for those daemons and (whiskey-drinking) bears. With all that talent, this movie about a golden compass would’ve been better if it went after the brass ring instead of compromising its story. That compromise ultimately shackles the movie’s soul and sabotages what it’s trying to accomplish. As for those boycotts, take it easy. There’s no reason to hate this movie. If anything, people should stop and think about the world them and question how and why people try to exert authority on others. Especially those who try to control people while flagrantly pursuing activities they condemn others for doing. At some point, it’d be nice if people came to terms with the concept that everybody has a belief system. Some people believe in God, some people believe there is no god. Others believe it’s all too much for the human mind to comprehend. Whether you believe in something or you believe in nothing, it’s still a belief. But, this is only a movie review written by a guy with a spider monkey for a daemon. The secrets of the universe will have to be unlocked at some other time, in some other article.